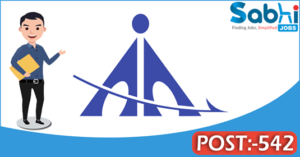 AAI recruitment 2018 notification has been released on official website www.aai.aero for the recruitment of 542 (five hundred forty two) Junior Executive Officer Vacancies. Job seekers should apply from 28th March 2018 and before 28th May 2018. Educational Qualification: Full Time Bachelor Degree in Engineering/ Technology/ Electronics & Telecommunications/ Electrical/ Architecture with 60% marks from a recognized institution/ University. Fee charges: Applicants who wanted to participate for AAI should pay the below charges through online mode (Debit or Credit Card / Net Banking). Interested and eligible aspirants may apply online through the website www.aai.aero from 28.03.2018 to 28.05.2018. Before submit in the application, the candidate must ensure that he/she fulfills all the eligibility criteria as laid down in this advertisement. The candidature will be purely provisional subject to eligibility and other verifications before or after his/her appointment in AAI. Information such as date of birth, Category and Sub‐Category [SC/ST/OBC (NCL)/Ex‐Serviceman], email Id once filled by candidate in the online application form will not be changed under any circumstances. A temporary correspondence address should not be mentioned as a correct permanent address to avoid any Boss in receiving communication at any stage. Candidates are advised in their own interest to apply on‐line much before the closing date of application mentioned in para‐6 of this Advertisement and not to wait till the last date for depositing the fees to avoid the possibility of disconnection/inability/failure to log on the AAI’s website on account of heavy load on internet/website jam/disconnection. AAI does not assume any responsibility for the candidates not being able to submit their applications within the last date on account of the aforesaid reasons or for any other reason beyond the control of the AAI. The decision of the AAI about the eligibility, acceptance or rejection of applications, mode of selection to the post etc. shall be final and binding. No correspondence will be entertained in this regard. The candidates selected for the post of Junior Executive (Electronics) shall have to execute a surety bond for an amount of Rupees five lakhs to serve Airports Authority of India for a period of three years after completion of training. No correspondence will be entertained from the candidates found ineligible and not called for document verification or for non‐selection. AAI will not bear any liability on account of Salary/ leave salary/ pension contribution etc., if any, of previous employment of any candidate already working in Government/Semi Government/Public Sector Undertaking. Information on website only: All correspondence with candidates shall be done through e‐mail and all general information shall be provided through AAI website. Responsibility of receiving, downloading and printing of call letter for document verification/offer of appointment/any other information shall be of the candidate. AAI will not be responsible for any loss of email sent, due to invalid/wrong email ID provided by the candidate or for delay/non receipt of information if a candidate fails to access his/her mail/website in time. Court of jurisdiction for any dispute will be at Delhi. No query seeking advice on eligibility will be entertained. The decision of AAI in respect of all matters pertaining to this recruitment would be final and binding on all candidates. AAI reserves the right to modify/alter/restrict/enlarge/cancel the recruitment process, if need so arises, without issuing any further notice or assigning any further notice/any reasons thereafter. The decision of the AAI Management will be final and no appeal will be entertained against this issue. Subsequent changes if any, made in the recruitment advertisement shall be communicated through the website. Hence, the candidates are advised to visit their email account/AAI website regularly for further updates.